DemoCurmudgeon: Silent no longer, Doctors and Major Medical Publications get behind Single Payer!!! 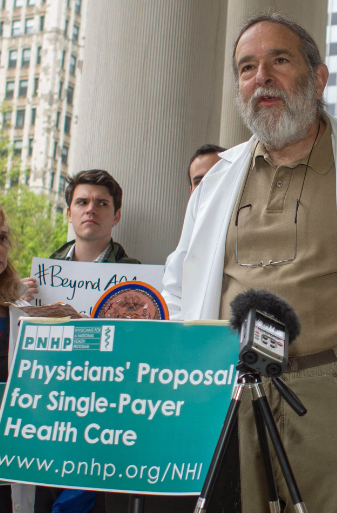 Silent no longer, Doctors and Major Medical Publications get behind Single Payer!!! In a dramatic show of physician support for making a decisive break with the private insurance model of financing medical care - 2,231 physicians called today for the creation of a publicly financed, single-payer national health program that would cover all Americans for all medically necessary care. The proposal was drafted by a blue-ribbon panel of 39 leading physicians. A 2008 survey of physicians found that 59 percent supported "legislation to establish national health insurance," up from 49 percent five years earlier. Doctors are now on the side of universal health care, big time. Why? Check out the following statement from "Dr. Adam Gaffney, a Boston-based pulmonary disease and critical care specialist, lead author of a recent editorial and co-chair of the Working Group that produced their proposal:"
"Caring relationships are increasingly taking a back seat to the financial prerogatives of insurance firms, corporate providers, and Big Pharma. Our patients are suffering and our profession is being degraded and disfigured by these mercenary interests." 1. Patients could choose to go to any doctor and hospital. Most hospitals and clinics would remain privately owned and operated, receiving a budget from the NHP to cover all operating costs. 2. Physicians could continue to practice on a fee-for-service basis, or receive salaries from group practices, hospitals or clinics. 3. The program would be paid for by combining current sources of government health spending into a single fund with modest new taxes that would be fully offset by reductions in premiums and out-of-pocket spending. Co-pays and deductibles would be eliminated. 4. The single-payer program would save about $500 billion annually by eliminating the high overhead and profits of insurance firms, and the massive paperwork they inflict on hospitals and doctors. 5. The administrative savings of the streamlined system would fully offset the costs of covering the uninsured and upgraded coverage for everyone else, e.g. full coverage of prescription drugs, dental care and long-term care. Savings would also be redirected to currently underfunded health priorities, particularly public health. 6. The "single payer" would be in a strong position to negotiate lower prices for medications and other medical supplies, yielding additional savings and reining in costs. Proposals floated by Republican leaders won't achieve President Trump's campaign promises of more coverage, better benefits, and lower costs, but a single-payer reform would, according to a commentary published today in Annals of Internal Medicine, one of the nation's most prestigious and widely cited medical journals. In today's Annals commentary, Longtime health policy experts Drs. Steffie Woolhandler and David Himmelstein warn that the proposals would slash Medicaid spending for the poor, shift the ACA's subsidies from the near-poor to wealthier Americans, and replace Medicare with a voucher program, even as they would cut Medicare's funding and raise the program's eligibility age. Single-payer reform could provide comprehensive first-dollar coverage to all Americans within the current budgetary envelope because of vast savings on health care bureaucracy and profits. 3. $75 billion doctors' billing and paperwork. They estimate that an additional $113 billion could be saved each year by hard bargaining with drug companies over prices. 4. The savings would cover the cost of expanding insurance to the 26 million who remain uninsured despite the ACA, "plugging the gaps in existing coverage. 5. Abolishing copayments and deductibles. 6. Covering such services as dental and long-term care that many policies exclude." The lead author of the commentary, Dr. Steffie Woolhandler, said: "We're wasting hundreds of billions of health care dollars on insurance paperwork and profits. Private insurers take more than 12 cents of every premium dollar for their overhead and profit, as compared to just over 2 cents in Medicare. Meanwhile, 26 million are still uninsured and millions more with coverage can't afford care. Dr. David Himmelstein, the senior author, said, “Polls show that most Americans—including most people who want the ACA repealed, and even a strong minority of Republicans - want single-payer reform. And doctors are crying out for such reform. The Annals of Internal Medicine is one of the most respected and traditional medical journals. Their willingness to publish a call for single payer signals that it's a mainstream idea in our profession."